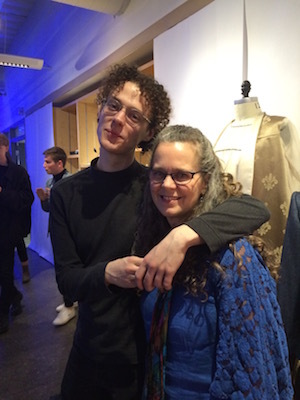 Last weekend I traveled to Nova Scotia to visit my son and attend a fashion show he was taking part in at NSCAD University where he is enrolled in art school. On the evening of the show, I was sitting in a chair that skirted the runway, watching people arrive and feeling the buzz of the event. My excitement was growing in anticipation of seeing Gabe’s fashion collection and the 4 models he had chosen. Awaiting the reveal tuned me into the magnitude of the moment. I realized that this show was the culmination of a multitude of new life experiences for my son that began 4 years previously when he moved away from home. This fashion show was distilling all of those changes and giving me the ability to see him in a new light. As I breathed in the emotion I was feeling, I felt my body fill with indescribable warmth. Being there alone helped me step into the deliciousness of the moment and I felt bathed in love. What an honour to bear witness to my young adult son in all of his glory. There is so much beauty in our everyday lives if we’re able to step into the place that is beyond distraction. Find a moment in your day today that is inviting you in. Step into that moment and linger there just a few seconds longer than usual to take in the nourishment. This entry was posted in new awareness, practices. Bookmark the permalink. Both comments and trackbacks are currently closed.